Home > Protection > Q & A: What is RFID? RFID stands for Radio Frequency Identification and is a technology used to identify objects, animals or people automatically. It is already in use in many everyday objects and has applications in relation to preventing identity theft as well as in other areas such as tracking goods, transport systems, microchipping pets and tagging library books. Although it has several benefits it also has potential drawbacks too. 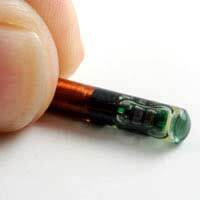 An RFID tag such as a microchip is implanted, for example in a document. It contains a link to a database of information. Using radio waves it can be read from up to several metres away by an RFID reader and does not need a line of sight. The tag has a circuit which can process information as well as receiving and transmitting radio waves. The idea is that key personal information is securely stored in the tag so that it can only be accessed by authorised personnel with the appropriate equipment. How Can RFID Help Fight Identity Theft? The aim of RFID is to create secure personal data in a format which is inaccessible to criminals and anyone who does not have access to the authorised equipment to read it. Instead of having data in a vulnerable document which can easily be read if stolen or viewed, RFID data is stored in a format which makes it difficult or impossible for a casual thief to get at. The aim of RFID in relation to identity theft is to create secure forms of identification which are unique to an individual and which are safe from the threats of theft or cloning. What Items May Use RFID? In terms of tackling identity theft RFID is used in several modern identification documents. For example the UK is one of several countries worldwide to now use RFID technology on all passports. The RFID chip contains all of the information which appears on the passport (including the photograph) and enables customs staff to quickly scan it with a reader to confirm someone’s ID. Other personal items may include driving licenses (although not in the UK) and staff security passes, allowing personal details to be accurately stored. RFID may also be used on goods and products which you buy. Look out for the EPC (Electronic Product Code) Symbol on items. Electronic Product Codes use RFID technology and may be attached to goods which you purchase. Look out for the symbol on items. It is usually embedded in the packaging and so will be thrown out after your purchase. By law you must be made aware of its use and be given choices about whether or not to discard it. Are There Any Downsides to RFID? Unfortunately, yes. Experts say that fraudsters may be able to copy RFID tags on identity documents. Although they should only be readable at a short distance by the automated readers criminals may be able to apply radio frequencies from further afield in order to capture the data. So, although the possible benefits of RFID look impressive it has not been universally adopted for this reason. The key is to stay alert, even when RFID technology is in place, and not to become complacent and compromise your security. Researchers have been able to break the RFID encryption for UK passports which means that your passport details may now actually be less secure than under the old system. It is unlikely that this will cause you any problems but it pays to be aware and to keep alert. Another criticism of RFID is that it can compromise personal privacy, especially when items have an RFID tag of which you are unaware.